MacBook, PowerBook, iBook, and other portable computing is covered in The 'Book Review. iPad, iPod, iPhone, and Apple TV news is covered in The iNews Review. Here's the NetMarketShare Operating System Total Market Share rundown of the significant players for September 2010 (August figures in parentheses) tracking changes over the the past month. Analysis summary is simple: iOS gained more ground, extending its lead over Linux. Windows slipped a bit, and the Mac OS gained a smidge. In terms of specific OS versions, Windows 7 grows, with all other Windows versions dropping back percentage-wise (although XP is still in front in raw numbers of users). Apple's Mac OS X 10.6 Snow Leopard is the most prolific Mac OS version, more than quadrupling OS X 10.4 Tiger's receding user share (holding on, though - only receding by a tenth of a point last month) - a contrast with Windows, where Windows XP (introduced shortly after OS X 10.1 in late 2001 and "replaced" by Windows Vista in late 2006, when Tiger was 1-1/2 years old) is still the most prolific version in the Windows space. Turning to browsers, Internet Explorer is down a bit more and Firefox down to just under 23 percent, with Chrome and Safari the biggest gainers over the month among the major browsers with Opera and Opera Mini both gaining as well. Former president of the Apple Products Division and Be, Inc. founder Jean-Louis Gassée blogs that once upon a time, operating systems mattered a lot, since they defined what a computer could and couldn't do, but today there are only two operating system: Unix (including Mac OS X, iOS, Linux, and Android) and Windows, which is why he contends that the OS no longer matters - or at least that we need to take another look at the word's content, at what we mean when we say Operating System. Gassée concedes that Windows will live on, with the PC industry at a plateau, but otherwise it's a Unix/Linux world, so we need to look elsewhere to find the differences that matter, which he says boils down to the user experience and development tools. "Were it not for Windows' long-standing installed base and overwhelming market dominance, it seems unlikely that anyone would argue seriously for the merit of the operating system, plagued as it is by high prices, security problems and vendor lock-in. "As an outspoken fan of Linux, I'll make no bones about where my preference lies - and that I think the success of the Mac is mostly a matter of marketing. Whatever your own personal beliefs, though, there's no denying that there are certain things Linux clearly does better than Mac OS X. If you're trying to decide on a platform for your business, these factors are worth keeping in mind...."
Editor's note: I can't dispute most of Noyes' assertions and observations, nor would I want to - except for her contention that "systems crashes and downtime are pretty much a fact of life when you're a Mac user." "...we continue to notice a single component of web pages is consistently responsible for the majority of the latency on pages across the web: images. Google hopes to add WebP support to its Chrome browser "in a few weeks". "Apple's recent overhaul of the Apple TV (Macworld rated 4 out of 5 mice) has pundits scrambling to analyze and dissect the company's renewed push into the living room. 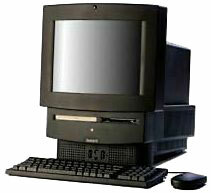 Judging from all the excitement, you might think 'Apple + TV' was something unique to the 21st century...."
Back in 1993, the Macintosh TV, Apple took its all-in-one LC 500 series platform with a Motorola 68030 CPU; gave it a black case, keyboard, and mouse (the only black desktop computer Apple ever sold in North America); added a CD-ROM drive, a custom-designed TV tuner/video input card, and an IR remote control; and released this elegant hybrid as the Macintosh TV. "Barry Wu, VP and spokesperson of Sintek Photronics has denied reports that the company is sampling projected capacitive touch panels for Apple's iMac. "An October 1, 2010 report cited industry sources saying Sintek has sent samples of projected capacitive touch panels to Apple for the latest iMac...."
"Remember that report from late last week that Apple was sampling displays for an upcoming touchscreen iMac? Well, fuggedaboutit. PR: Other World Computing (OWC) has released a sneak peek video of its Turnkey Upgrade Installation Program for the Mid 2010 Apple iMac 27" (see below) which shows end users how they can increase performance while overcoming the iMac's notoriously high upgrade difficulty. The video highlights the intricate skills OWC's professional installers employ to add the first eSATA port option offered for an Apple iMac computer, up to three award-winning OWC Mercury Extreme Pro Solid State Drives up to 480 GB each, a larger capacity hard drive up to 2 TB, and/or OWC Memory Upgrades up to 16 GB. The new professional installation service program offers multiple configuration options starting at $169 with a 48 business hours or less installation turnaround and includes complete shipping options along with OWC's renowned warranty coverage. By custom engineering the first ever eSATA port option for an iMac computer, OWC enables iMac 27" users to experience faster data backup and transfer rates up to 300 MB/s - up to 3x faster than FireWire 800, the fastest factory stock interface. The $169 service includes an OWC Flexible eSATA cable for Plug and Play use with any external storage solution equipped with a standard eSATA port and return shipping of the eSATA enhanced iMac. Up to three OWC Mercury Extreme Pro SSDs can be installed in capacities up to 480 GB, up to a full 261% greater capacity than the single factory 256 GB SSD option, and offer read/write speeds in excess of 270 MB/s - up to 40% faster than the factory and/or other currently available SSDs. While many SSDs experience significant performance degradation over time, this is not the case with the OWC Mercury Extreme Pro SSD. By employing advanced block management and over-provisioning, the OWC Mercury Extreme Pro SSD provides the ultimate in reliability and long-term high performance. iMac 27" owners requiring more storage capacity than the factory stock 1 TB drive can have OWC replace the stock drive with a 2 TB capacity. Or, instead of a traditional hard disk drive, OWC can add a second SSD to the main drive bay so users can create a unique SSD RAID configuration. For the iMac 27" owner who desires maximum storage capacity, OWC can replace the factory optical drive with an OWC SSD model up to 480 GB via a custom OWC mounting bracket/cable solution. iMac 27" owners seeking to expand memory configuration up to 16 GB will find savings up to 60% compared to same size factory installed upgrades. This insightful video (see above) really demonstrates two aspects: how difficult the iMac is to upgrade as well as how to overcome that limitation by having upgrades installed by a trusted, reliable source. Larry O Connor, Founder and CEO of Other World Computing says, "We created this one of a kind program to help iMac users join other Mac computer users who have experienced the benefits of faster, bigger, and better options for memory and storage that turn a Mac into the best performing machine a user can own." Link: OWC Turnkey Upgrade Program for 2010 Apple iMac 27"
PR: Razer, which makes some of the best-engineered and interesting examples in the category, this week unveiled a new suite of Razer Naga Special Edition gaming mice - - the Razer Naga Maelstrom Special Edition and the Razer Naga Molten Special Edition. 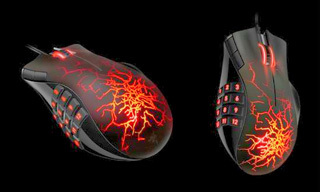 In addition to the Maelstrom version, Razer will also release the Naga Molten Special Edition which glows with a fiery lava-red hue from fissures cutting a jagged path across its housing. The MMO-optimized buttons also glow a blazing crimson color. The Razer Naga Maelstrom Special Edition and Razer Naga Molten Special Edition feature an exciting new look to the original Naga, with its multibutton thumb grid and MMO game interface add-on that place every command an MMO gamer needs in the palm of his/her hand, combined with an ergonomic form shaped to maximize ease of use lets gamers play in comfort for lengthy session when you get your game on. 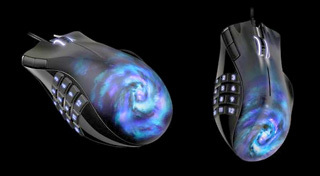 Product features include a glowing vortex design and blue backlighting, 17 Fully-programmable MMO-optimized buttons (including 12 button thumb grid), a 5600 dpi Razer Precision 3.5G Laser Sensor, 1000 Hz Ultrapolling / 1ms response time, zero-acoustic Ultraslick feet, optional MMO-specific software AddOns, and unlimited character profiles with AddOns. PR: Elements 9 offers much of Photoshop's power without the huge price tag. It's an ideal tool for most image-editing buffs - including scrapbookers, photographers, and aspiring graphic artists. But Elements still doesn't come with a decent manual. Photoshop Elements 9: The Missing Manual (O'Reilly Media, $44.99), will help you get the most out of the program, from the basics to advanced tips for both Windows and Mac. "Elements 9 has some major new features, like Layer Masks, and the Organizer for Mac, that are very powerful but not easy to figure out, as well as some fun new features that you may well overlook if you don't know where to find them," says expert author Barbara Brundage. "I hope that the book will help my readers understand how to get the most from all of them." More information about the book, including table of contents, index, author bios, and cover graphic, is available online. PR: A groundbreaking exposé of the hidden truths of electropollution, Zapped is the first comprehensive, step-by-step guide to counteracting the invisible hazards of everyday electromagnetic exposure. Author, nutritionist, and First for Women magazine columnist Ann Louise Gittleman combines the best of energy medicine with the latest scientific research in a user-friendly powerhouse designed to safeguard you and your family: Zapped: Why Your Cell Phone Shouldn't Be Your Alarm Clock and 1,268 Ways to Outsmart the Hazards of Electronic Pollution. Gittleman reviews the latest scientific research and provides a proactive plan to counteract the toxic effects of overexposure, noting that 84% of Americans own a cell phone, 89 million of us watch TV beamed to us by satellite, and we can't have a cup of coffee our local café without being exposed to WiFi. Wireless Internet, smart phones, and laptops have transformed the way we work and live. But what are the consequences of this revolution? The same technology that allows us to video chat with friends across the world and surf the Internet from the comfort of our beds has exposed us to a dangerous and unprecedented number of electromagnetic fields (EMFs). We are constantly being exposed to EMFs invisible lines of force that surround all electrical devices at a rate 100 million times greater than our grandparents were. In her new book Zapped (HarperOne, Hardcover $25.99, on-sale October 2010), health expert and New York Times best-selling author Ann Louise Gittleman informs about the invisible hazards of the 21st century that will motivate us to change how we use our laptops, how we locate our home electronics and televisions, and even how we sleep. Radiation from cell phones is just the tip of the iceberg. In Zapped, Gittleman explores emerging evidence that EMFs from wall outlets, refrigerators, computers, dimmer switches, hair dryers, and a host of other everyday devices are creating energy disturbances within the body, leading to increased free radicals and disruptions in cellular DNA, which are in turn linked to a wide range of negative health effects, including tumors, chronic fatigue, and other diseases. These risks are especially high for children, whose developing bones are thinner than adults, making them even more vulnerable to electromagnetic disturbances in the brain and other organs. Zapped is a call to action. Gittleman reviews the latest scientific research and provides a proactive plan to counteract the toxic effects of overexposure. Small changes, including how we use our electronic devices and how we arrange our living and working spaces, can make a big difference in our levels of exposure to EMF radiation. Her practical approach moves room by room, teaching readers how to identify and remedy the electromagnetic trouble spots in their homes and offices. Hold your cell phone away from your head when the call is connecting as that's when the signal is strongest. Keep televisions out of the bedroom. * They emit AC magnetic fields that interfere with the production of melatonin, the hormone that governs your Circadian rhythms. Eat to beat EMFs. Superfoods and seasonings such as artichokes and cinnamon help to replace the antioxidants, enzymes, and nutrients that electro pollution can rob from your body. Gittleman's expertise in nutrition allows her to formulate a diet that turns your body into a shield against EMFs and other electronic dangers. Are we going to give up our cell phones, laptops, and other electronics? Absolutely not, but emerging scientific evidence tells us that it is crucial to make important changes in our home and work environments. A must-read for anyone who is plugged in, Zapped teaches readers how to survive the dangers of technology and thrive in the wireless age. For more information, visit the official areyouzapped.com website. New York Times best-selling author Ann Louise Gittleman is respected as a health pioneer, weight-loss expert, and award-winning author of thirty books, including The Fat Flush Plan. Ann Louise's credentials include an M.S. in Nutrition Education from Columbia University and a CNS from the American College of Nutrition, and her work has been featured in Time, Newsweek, The New York Times, CNN, The Wall Street Journal, USA Today, The San Francisco Chronicle, and many other outlets. Gittleman has been recognized as one of the top ten nutritionists in the country by Self magazine and has received the American Medical Writers Association award for excellence. PR: Logos is shipping Logos 4 Mac, offering special discounts on all of the base packages and base package upgrades. The company says completion of Logos 4 Mac is another huge step in its "one license, any platform" philosophy. Logos Bible Software makes it easy to access the resources in your library when and where you need them whether it is on Mac, Windows, iPhone, iPad, or on the Web with Biblia.com. In mid-2006, the development team at Logos started working on the project that would eventually become Logos 4 by throwing out much of the work that had been done since 1999 and re-imagining what Bible study could be like, then choosing new technologies and redesigning features to help make the product more approachable to the new or casual user. The team working on Logos 4 for Macintosh is the same size that the original Windows team was in early 2006. Catching up to the Windows version of Logos 4 has been no small task, but delivering Logos 4 for Mac makes it all worthwhile. PR: The Pixelmator Team released Pixelmator 1.6.2, an update to their GPU-powered image editing tool for Mac OS X. Pixelmator provides the tools needed to create, edit, and enhance still images. Available as a free software update, Pixelmator 1.6.2 adds support for the new WebP image format (more above). WebP is an image format developed by Google that can be used on photographic images. Other changes in Pixelmator 1.6.2 include minor improvements and several bug fixes. "WebP is the best format for saving images for the Web," says Saulius Dailide of the Pixelmator Team. "And we are very happy that Pixelmator 1.6.2 is the world's first complete WebP editor." WebP is an image format developed by Google that can be used on photographic images. The degree of compression for WebP is adjustable, so a user can choose the tradeoff between file size and image quality. WebP typically achieves an average of 39% more compression than JPEG and JPEG 2000, without any loss of image quality. Webmasters, web developers, browser developers, and designers can use Pixelmator to open and edit WebP images as well as to save or export images or image slices to the WebP format to create smaller, better-looking images. Users can even use Pixelmator's Export for Web feature to adjust the degree of compression and preview the adjustment instantly. Pixelmator 1.6.2 is available for $59 and is a free update for current Pixelmator users. System requirements as well as a free 30-day Pixelmator trial and more information about Pixelmator can be found online. Also see Charles W. Moore's recent review of Pixelmator 1.6 on PB Central.